They too become part of the Harmony of the Universe. Mick Bremans, Chairman, Ecover In times, when business leaders are struggling with volatility and uncertainty about the future of their organizations, Giles Hutchins lays out a path for transformational change. Nature has already shown us the way to solve many human problems, from deciphering simple engineering puzzles to unlocking the mysteries of flight. He demonstrates clearly how behaviors and organizations found in nature can be applied to help companies flourish in chaotic and uncertain times. So that Grace can breathe through us more deeply in our midst, our morning midst of metamorphosis. Deep within the story of Britain — and the West — is a psychic wound. Soon the transformation becomes lifeless — yet another cook-book consultancy model or managerial method that does little to move us towards the vibrant, flourishing, regenerative futures our hearts know is possible. Social design systems — whether they be Swarm or White Space technologies, Art of Hosting or Holding Space, Agile Leadership or Authentic Leadership, Holacracy or Sociocracy — only come alive when they are lived amid the journey towards wholeness. We are in the midst of a metamorphosis; profound shifts are affecting the way we work, how and why we do things and the purpose and meaning we bring to our organisations, systems and wider civilisation. This is all designed to guide participants into a transformative leadership paradigm. Eclipsing current approaches to responsible and green business, Hutchins' focus is on the emergence of new ways of operating and creating value in an increasingly volatile and interconnected world. In , Giles Hutchins makes a compelling case for applying the same principles of biomimicry to the development of a new business paradigm. Giles takes us through this remarkable world of business seen through the eyes of nature. Beware: this book is not for the faint-hearted. But though in the market place he seems to be an ordinary man, something happens to the people among whom he mingles. Enlightened mingling in the marketplace with wine-bibbers and butcher, he recognises the inner light or Buddha-Nature in everyone. Giles Hutchins is a management consultant who guides businesses and organizations through the process of redesigning for resilience in challenging times. And to my surprise they talked about things that have been in my mind for quite a long time: purpose, values, communication, language, the meaning of leadership, how to engage people, and so on… For the first time in my life I caught myself thinking that I could start my own business, not alone of course, but with friends that share the same values and purpose, that are driven by the same desire to change things in a way that is inspired by Nature and Beauty. As well as engaging with a multitude of for-profit businesses, he engages with a number of leading non-profit organisations such as the Royal Botanic Gardens Kew, Earthwatch, Schumacher College, The World Wild Fund for Nature and regularly presents at leading business schools, universities, global conferences and blogs for a number of leading sites including. If we dare, we become conscious co-creators participating in this web of life. Not only are you welcomed into an inspiring network of amazing people, but you also leave with a wealth of tools, stories and frameworks that you can apply to your work and your life. The deep reflection, deep listening, space to reflect, energy work, somatic engagement — all of this is part of what allows the inner-journey to transform our outer ways of showing-up in the workplace. Monika Winn, Business Strategy and Sustainability Director, Centre for Social and Sustainable Innovation Peter B. Michelle Holliday, Principal of Cambium Consulting and author of Humanity 4. Giles Hutchins is a management consultant who guides businesses and organizations through the process of redesigning for resilience in challenging times. Author Giles Hutchins presents the challenges to the prevailing 'business as usual' model, explains the pressing need for transformational change, and reveals the concepts and mindsets necessary to inspire the businesses of tomorrow. I was able to deeply reflect on my life, my purpose and the changes that I needed to make in my life, to enhance my effectiveness as a leader within my work at a business school. The Regenerators is a collective of professionals coming together to aid the emergence of a new thriving paradigm built on regenerative principles. Our relationship with others — our ability to allow this deep sociality and empathy we have as human beings, or to get caught up in heightened ego-accentuation, projection, control, fear and polarisation. It is this that underpins self-management, agility, and learning developmental organizational cultures. 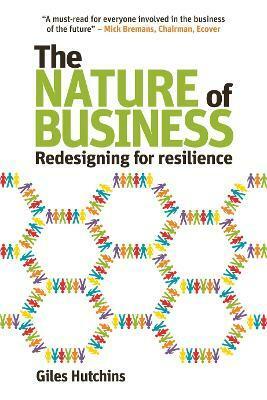 About this book The Nature of Business sets out a new business paradigm. These alternative ways produce outcomes that are more humane, regenerative, sustainable, redistributive of wealth, ideas and resources. A photo of some participants discussing leadership at Schumacher So it was a privilege teaching, and I hope that I get the opportunity to do it again. To be viable, the firm of the future will need to create conditions conducive to life and well-being. This is a brave book and a must read for those seeking to make positive change happen in business and beyond. Gustavson School of Business, University of Victoria Infused with ancient wisdom, and in equal parts provocative and practical, this book serves as a compass for business leaders to build the firm of the future -- a firm that creates conditions conducive to life and well-being. This is what we explore, indeed activate, in this unique one day immersion workshop near Copenhagen 20 th November 8. He demonstrates clearly how behaviors and organizations found in na Nature has already shown us the way to solve many human problems, from deciphering simple engineering puzzles to unlocking the mysteries of flight. We shall cover the tools, insights from living-systems, and practices required to up-stretch into this next-stage leadership consciousness. The workplace is not a therapy room, and we need to get on with doing while also contributing to a nurturing wholesome environment. This book will be an inspiration to the leaders of the future and I highly recommend it to anyone ready to be inspired by nature. A business to help others be more open to different ways of learning, different ways of seeing, becoming more connected with their inner self, that are connected with their true sense of purpose. Here is some feedback from one of the participants from Brazil: The first week had Giles Hutchins and Alan Moore as teachers, two generous teachers! He engages with a number of leading non-profit organisations, such as the Royal Botanic Gardens Kew, Earthwatch, Schumacher College and The World Wildlife Fund, and regularly guest-lectures at leading universities and presents at conferences on sustainable business. So how do we adequately act upon this monumentous moment in our human history? In The Nature of Business, Giles Hutchins makes a compelling case for applying the same principles of biomimicry to the development of a new business paradigm. The E-mail message field is required. We are searching the threads of a broken and forgotten story. The Nature of Business makes the compelling case that the 'Firm of the Future' should seek to mimic behaviours and organisations found in nature, which offer fitting models for businesses capable of flourishing in chaotic and uncertain times. A timely, paradigm-shifting book, reframing how business can thrive in the challenging times ahead whilst being a force for good. Clare Graves, the originator of Spiral Dynamics, refers to Tier Two consciousness — Teal, Turquoise, Coral — as having an echo of the early Beige and Purple animistic levels of consciousness, and yet being quite different. A world where products, services and organizations leave more value than they take.